This last Tuesday was HAIR DAY. Ever heard of the sports term HELL DAY, well this is pretty darn close. Tuesday morning I took Daesha's extensions out. Later that afternoon I started braiding. I am still pretty slow I finally had to stop at 11:00 pm and finish the rest the next day. 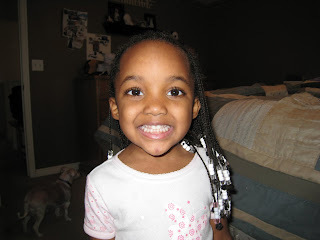 Every time I try to cornrow her hair it looks terrible! I know how to do it and I can sorta' Anyway I decided that I was going to give it another try and even if its not fantastic I was going to leave them in and just keep practicing. I took these pictures to hopefully look back one day and laugh because hopefully I will get better at doing them. 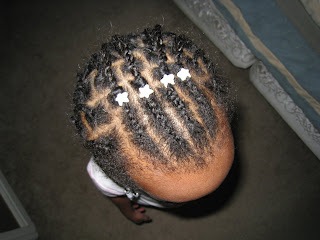 Maybe one day I will be cornrowing her whole head and not just a couple inches. Daesha does amazingly good to sit for as long as she does. It's fun to talk and watch the tv together but I honestly didn't realize how much work it would be to take care of her beautiful hair. Just a small rant and also to let you all realize the work I go through. First it starts with the product do and don'ts.. Its good to use all natural products but then it breaks down quickly and "goes bad" meaning it gets this rotten fruit smell. So if I am spending the extra money for all natural I am buying it twice as oftain because it goes bad so fast. Then there is the shea butter and natural oils you put on the days you dont wash the hair but if its used too much you could clog the pores and you never use mineral oils or petrolatum. Dont over wash.. Daesha only washes her hair once a week. Never use synthetic colors or fragrances. Keegan is especially irritable to fragrances so I use Cetaphil body wash and lotion on both kids. For the tuff dry areas I use Aquaphor. Both kids get lotioned up every day. So after knowing the basic hair care I still haven't found a product I love. I have tried all sorts of things and found some great shampoos, detanglers, leave in conditioners, pomade (used for braiding) a product for dry itchy scalp and of course braid spray. 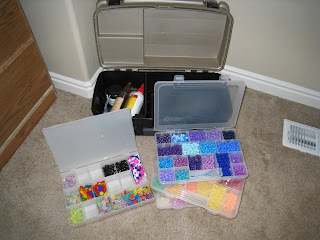 I have to admit the clips and beads are so much fun to use. 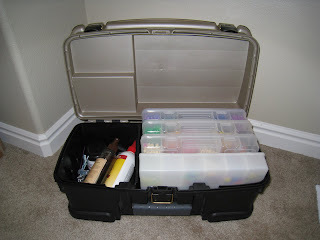 I put all of Daesha's hair stuff in this fishing tackle box. It works great! You might laugh at some of the things in her box. It has things like crochet needles and floss threaders which I really do use for her hair.Ok I've gone on long enough. If you have read through this spill I am interested if you have a great product you use, or know of one someone else uses. 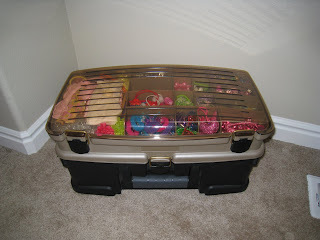 If you have a little girl this is a great hair box. 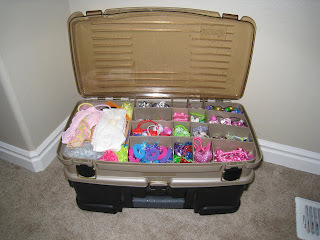 It will fit anything from elastics to pony tails to ribbons, hair clips and BEADS! I just got it at Walmart. Ha Ha, I feel your pain. Her hair looks great, and hey at least you have hair to braid. Try growing hair on an unwilling head. Way to go, I think it looks great and I am still way amazed that she will sit still that long! Is she super excited about her birthday coming up? You should look back at the pictures you took the very first time you did her hair. You've improved a lot. My friend has hair like Daesha's and she recommends Head and Shoulders shampoo. She says its good if your scalp is dry. As for conditioner she likes the Mane and Tail leave in stuff. I know its for horses but it does "wonders" for her hair. wow, the things mothers go through!! i think it looks great! !